I love the names of dishes from India. 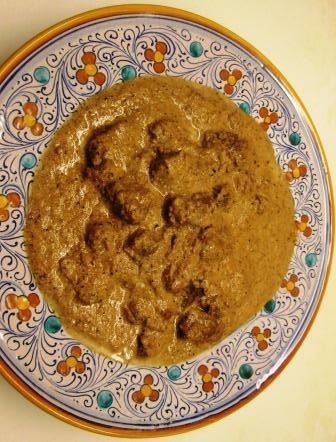 Unlike the prosaic English versions of the two in my title – Lamb in Fragrant Garlic Cream Sauce and Baked Eggplant Stuffed with Cheese and Herbs – the exotic Hindi names are so mysterious and appealing! (At least I think that’s Hindi, though it might be Kashmiri or Punjabi or another of the 22 official languages of India.) And I love the flavors of India, whatever their names. 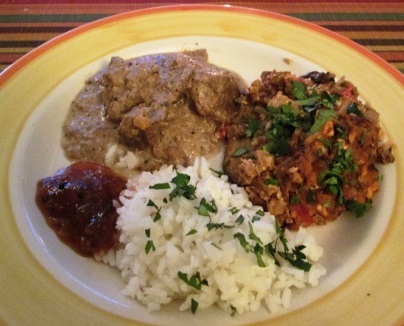 Rogan Josh is a particular favorite. Whenever Tom and I go to an Indian restaurant, one of us is bound to order it. But I’d never made it at home, so that was one of the dishes I chose for my latest foray into Indian cooking. For the second I picked an eggplant recipe, to partner with the lamb. 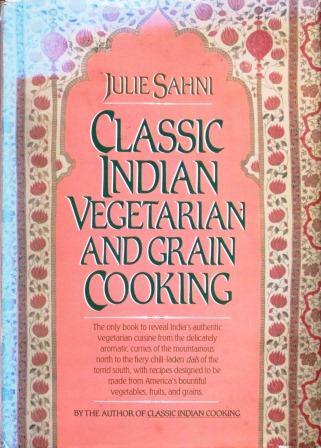 This recipe is from Julie Sahni’s Classic Indian Vegetarian and Grain Cooking. She calls it an elegant and beautifully seasoned preparation, but mine didn’t turn out exactly so on either count – though it looked very good on the page and smelled lovely all through its cooking. I cut a rotund one-pound eggplant in half and carefully scooped out the flesh, leaving thick enough walls (as I thought) to hold the stuffing. The stuffing was a sauté of chopped onion, ginger, the eggplant pulp, tomatoes, green Bell pepper, cayenne pepper, ground coriander, lemon juice, salt, and pot cheese – the last an acceptable substitute for the Indian cheese called chenna. 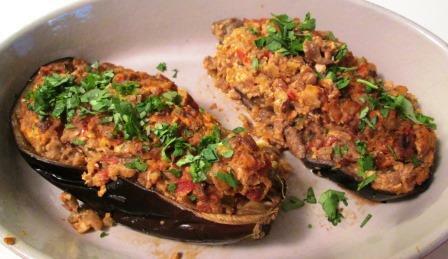 I filled the eggplant shells with the mixture, set them in a baking dish, and drizzled on olive oil. They were to be covered with foil and baked for 30 minutes; then uncovered and baked 15 minutes more. I wanted a pan deep enough to keep the cover from touching the filling, and my best pan for that was fairly large. And because of the curvature of the shells, the two stuffed halves didn’t sit perfectly level. So when they came out of the oven, the shells had slid around in their oozing juices, partially collapsed, and spilled some of their filling. I thought I’d left enough flesh on the skins to make the shells hold up, but I guess I hadn’t. In that picture the eggplants are not in the pan they were cooked in. Because of their unfortunate deconstruction, I transferred them to a shallow dish for serving, refilling and reshaping the shells as best I could. And I topped them with chopped cilantro, as recommended. So how did they taste? Well, all right, but not a big winner. The eggplant pulp hadn’t taken on much of the other flavors, and to me it was still somewhat bitter. Dabs of papaya-orange chutney and mango-chili pickle helped it a lot. Tom liked it more than I did: He thought the bitterness minor and relished the mélange of other flavors. I noticed, however, that he availed himself of the Indian pickle and chutney pretty freely. With all the other good things there are to do with eggplant, I’m not likely to make this particular dish again, though I might try a different Indian eggplant recipe before local eggplant season ends. 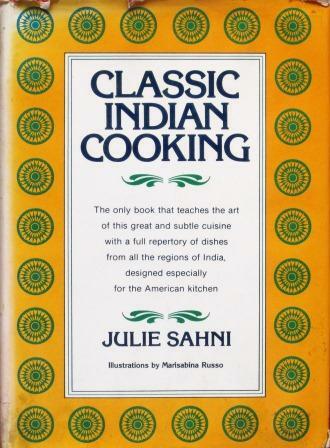 The recipe I used for Rogan Josh is from Julie Sahni’s Classic Indian Cooking. 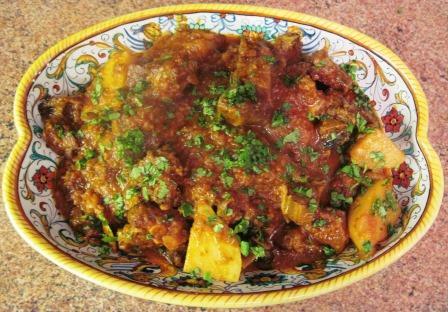 This is my favorite Indian cookbook, and I often do lamb dishes from it, but almost always using its recipe for Ghosht Kari, which is a spicy tomato-based stew. Rogan Josh is something else entirely. First, boned lamb leg meat is cubed and marinated for a few hours in an aromatic puree made from onions, ginger, coriander, cayenne, yogurt, sour cream, and ghee (or melted butter). Then it’s cooked slowly, still in its marinade, until the lamb is perfectly tender –­ about two hours. The cooking aromas were enticing. After that, in a small pan, you quickly fry chopped garlic, ground cumin, ground cardamom, and garam masala in more ghee, producing more appetizing smells, and stir the mixture into the lamb’s pot, along with a healthy dose of heavy cream. Then the whole concoction has to sit at room temperature for at least two hours. I did all this a day in advance, because Sahni says it improves with keeping. The next evening I simply heated it up and served it. Even though it looked unfortunately a bit like dogfood, the Rogan Josh was really delicious, rich and mellow, without the palate-searing chili heat of many Indian dishes. Those cooking aromas hadn’t lied. Like the eggplant, it had no objection to judicious applications of cilantro, chutney, and pickle. The lamb was beautifully tender and well-seasoned, and the sauce was excellent over plain white rice – and also fine to mop up with warm parathas. Unlike the eggplant, the lamb is a dish I will definitely make again. Just before we left on our Texas birding trip, Tom and I did another of what we call our cookathons with our friend Hope. These involve many advance days of ethnicity decision, recipe selection, shopping list creation, and ingredient purchasing. On the day itself, Hope arrives at 3 p.m. and we all start cooking. With luck, we manage to sit to dinner around 7, fairly well exhausted from the kitchen work but anticipating a splendid meal. 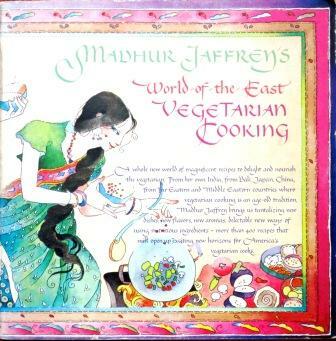 India was our selected cuisine this time, and the recipes came from three cookbooks: Vineet Bhatia’s Rasoi: New Indian Kitchen, Julie Sahni’s Classic Indian Cooking, and the same author’s Classic Indian Vegetarian and Grain Cooking. Here’s the menu we chose. Shrimps, crab, goat, veg: That didn’t sound too complex. But we sort of forgot how very labor-intensive Indian food is to prepare. From 3 to 5 pm, with only a little time out for a glass of prosecco, the three of us did nothing but chop and grind things. The kitchen counters were totally covered with little dishes of red and white onions, garlic, ginger, green chilies, coriander seeds and leaves, curry leaves, cumin seeds both plain and toasted, and measured amounts of other spices. Only after two hours of that could we start actually cooking. I won’t give you the play-by-play, because it got very complicated – starting one dish, moving to another while the first simmered, on to a third, back to the first, and so on: Tinker to Evers to Chance for another two hours and more. (Also washing pots and bowls as needed to reuse them.) I’ll just tell you about the principal dishes as we – ultimately – ate them. 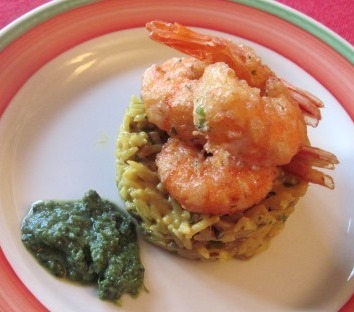 This, from the Rasoi cookbook, was a lovely shrimp preparation, unlike anything Indian I’d ever had before. Because of the amount of work it took, there’s no question this is really a restaurant dish, but we all loved it. The shrimp are dipped in a batter of egg, cornstarch, chopped coriander leaf, and cayenne, and then deep-fried. They’re placed on a cushion of khichdi, which is made as follows. Heat oil and butter in a pan, sauté cumin seeds, garlic, ginger, chili, and red onion. Add turmeric and basmati rice. In a minute, add vegetable stock and cook until the rice is almost done. Finish with yogurt, butter, salt, and chopped coriander leaf. We set ring molds on three plates and spooned the khichdi into them. To our pleased surprise, when we removed the rings the rice stayed in neat little cylinders. We topped them with the fried shrimp, added a pool of green coriander chutney (it was supposed to be piped in a decorative ring around the plate, but hey!) and sat to our first food of the evening. It was well worth the wait. The combination of flavors was astonishingly good. And rich. The khichdi was particularly luscious. I think I’ll make that again to serve just on its own. The crab cakes, also from Rasoi, were also lovely. To assemble them we had to sauté black mustard seeds in oil, add chopped curry leaves and chopped onion; sauté some more; add chopped garlic, ginger, and green chilies; sauté some more; stir in a paste of cayenne, turmeric, and water; add crab meat and sauté some more; stir in grated parboiled potato, and season with chaat masala. All that could be done a little while in advance. When ready to serve, we had only (!) to form the mixture into cakes, dip them in egg, coat them with breadcrumbs, and deep-fry them. The mixture was very soft, and we wondered if the cakes would just fall apart in the deep fryer. 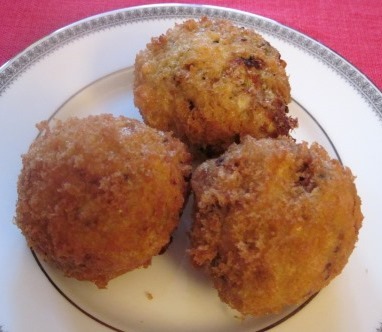 But no, they behaved very well, coming out as crisp, golden brown 3½-inch balls. The chaat masala flavoring was new to me, and a welcome discovery. It’s an intriguing mixture of black salt, green-mango powder, cumin, mint, asafoetida, cayenne, nutmeg, black pepper, and regular salt. It’s used in many dishes, and I understand it’s also good just sprinkled on apple slices. I’m going to try that soon. Ghosht Kari, a recipe from Sahni’s Classic Indian Cooking, is an old standby of mine. I’d only ever made it with lamb before, though in India, goat is the meat of choice for this dish. We first browned pieces of goat in oil, removed them and browned onions in the same pan; added garlic and ginger; then cumin, coriander, turmeric, and cayenne; returned the meat to the pan and added a puree of yogurt, tomatoes, garlic, and ginger; added hot water, covered the pan and let it all simmer together, adding chunked potatoes partway through the cooking. While the lamb version of this curry was always done in two hours, we had to cook the goat quite a lot longer before it got tender. Then the dish needed to rest for a few hours before being reheated and served, sprinkled with ground roasted cumin seeds and chopped coriander leaves. It was a little disappointing – possibly because the first two dishes were so spectacular, and possibly because we’d made a marketing error here and not gotten the goat from our ever-reliable butcher Ottomanelli’s: It had too much bone and too little flavor. The dish was nice enough, but not as spicy-hot as it had been in the past. We relied on the various chutneys to make it more interesting. We were trying Patna Korma, a recipe from Sahni’s vegetarian and grain cookbook, for the first time. The vegetables are eggplant, zucchini, carrots, and green beans. 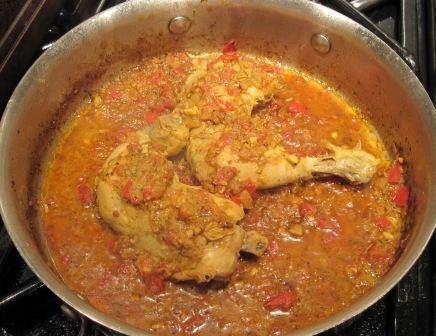 The braising medium is yogurt, tomato puree, ground almonds, fried onions, cumin, coriander, turmeric, cayenne, and black pepper. When the dish is done, it’s sprinkled with garam masala and chopped coriander leaf. The recipe was supposed to develop a “delicate velvety” sauce, with a “complex but subtle” spicing. Alas, it came out tasting much like the sauce of the goat curry, along with which we served the vegetables, and therefore not the interesting contrast we had hoped for. Also, the instructions for cutting up the vegetables didn’t work. The carrot pieces were too thick to soften even after extra cooking time, while the eggplant and zucchini pieces were ready to fall apart before then. The green beans were the best part of the dish. Alongside the curry and vegetables, we had plain boiled basmati rice, a dal of pink lentils dressed with melted butter and sliced garlic, and a raita of Greek yogurt with slivers of cucumber and tomato. The latter two are dishes I almost always serve in an Indian meal, but they didn’t contribute much this time. My lentils, which had been sitting in the pantry for some time, must’ve been too old, because they had little flavor, and neither of the two main dishes was so spicy-hot for us to need the usually welcome coolness provided by raita. However, I learned a great way to handle basmati rice. Indian cookbooks always call for elaborate preparation of this prized rice from the foothills of the Himalayas. Typically you’re told to rinse it in water nine times, soak and drain it, parboil and drain it again, finally steam it carefully over very low heat. Happily, Hope told us that she always cooks basmati as if it were pasta – just dumps the dry rice into boiling water and cooks until it’s al dente. So we did that, and it was perfectly fine. With this whole meal, we drank Trimbach Gewürztraminer, a wine whose own spicy flavor stands up well to the multiple flavors of Indian dishes. And afterwards, we tamped everything down with – surprise! – a grappa. Even a confirmed carnivore sometimes needs a big vegetable fix. It’s easy in summer: So many things from the vegetable garden can simply go, alone or with others, into a sauté pan with olive oil and make a totally satisfying meal, with only a chunk of crusty country bread. In mid-winter, a vegetarian dinner takes more effort, but the results can be proprotionately rewarding. 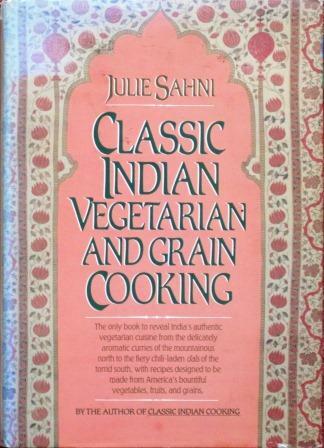 Today’s recipe is a case in point: Sabzi Korma from Julie Sahni’s Classic Indian Vegetarian and Grain Cooking. 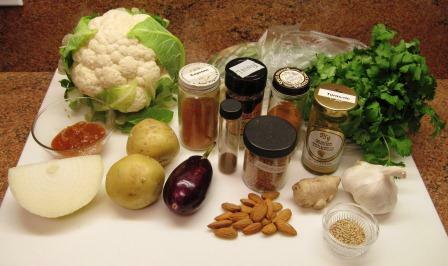 Her English name for this dish is Cauliflower, Eggplant, and Potatoes in Herb Sauce, which is a fair rendition – as long as you understand that when an Indian cook talks about herbs, she means something other than the usual Western notion of a few chopped leafy things, or even the French complex of fines herbes. This is a Moghul recipe, a dish of the korma type, which Sahni says are among the most elegant preparations in vegetarian cooking. Beyond the three main vegetables, it calls for 13 flavoring ingredients, not many of them herbs. One of the reasons I chose it was because – to my astonishment – I had most of them in my pantry. I had to buy only a cauliflower, an eggplant, a piece of fresh ginger, and a bunch of cilantro. Here’s everything it needed. 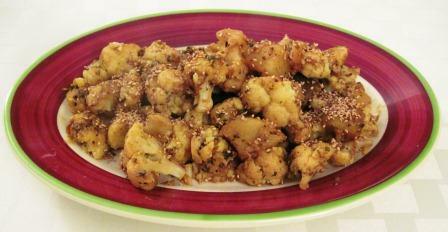 Reheated it briefly, put it in a serving dish, and sprinkled it with toasted sesame seeds. I found it an unexpectedly harmonious preparation. Despite all those strong seasonings, it was not too assertively flavored: Each vegetable piece tasted attractively of itself and of the symphony of seasonings. You really wouldn’t have been able to tell what all those were because they blended together so well. In a way, that was a negative for me, because I like the flavors of most of them individually, and in this dish you couldn’t appreciate them for themselves. But it was certainly different from my usual ways with vegetables, even other Indian vegetable dishes. The cauliflower was so dominant that if I do this again, I’ll think I’ll cut its quantity and use more potato and eggplant, which – though all the vegetables were quite mild tasting – made a pleasing flavor and texture contrast. I’d never cooked fresh cilantro for such a long time as this. It’s hard to tell what if anything it contributed to the dish, but trusting Sahni, I assume it must have done something. It’s not easy to grate ginger. On any of my graters, it tended to squish into juice and leave behind little spicules of dry fiber. It’s not too easy to toast sesame seeds, either – as soon as the pan gets hot they tend to pop out and jump all over the stove. The dish got even better after it had cooled down somewhat. Finally, I have to give apologies to the Moghul emperors (and to my friend Teresa) because I didn’t make a truly vegetarian meal with this dish: I served lamb chops alongside it. They went together very well. Tom, however, whose childhood was not blighted by repulsive okra dishes, inexplicably (to me) liked okra gumbo, so I had to learn to tolerate the pestilential vegetable. But he had to be the gumbo cook, because I couldn’t bear to look at the nasty, viscous ooze in the cooking pot. 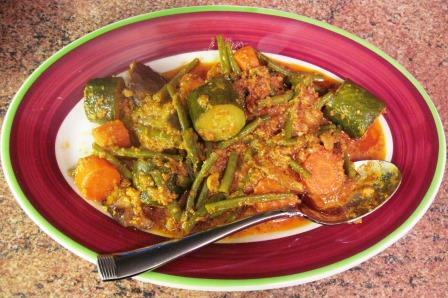 Once it was thoroughly cooked, along with the crabs and shrimps and other flavorful things that gumbos can be made with, I didn’t mind the flavor of the okra, and so we went on for a number of years – he happily, me resignedly. We never did anything else with okra. 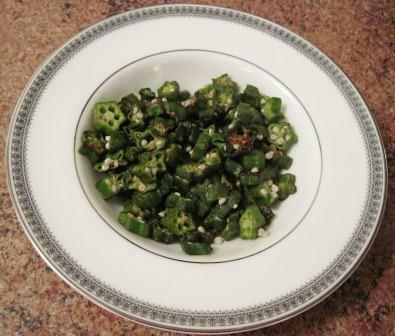 Then, just recently, my friend Joan was raving about an Indian okra dish she had discovered. It sounded different from anything I’d ever known about okra. She sent me the recipe, but a major ingredient was chaat masala. I wasn’t sure I’d like the dish enough to buy some, and my pantry (good as I think it is) doesn’t run to asafetida, mango powder, and black salt, which I’d need to make it at home. 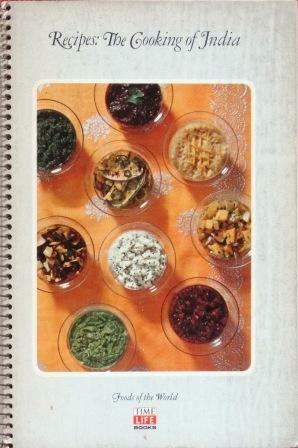 So I looked for other recipes in my own Indian cookbooks. Wow! Was that possible? 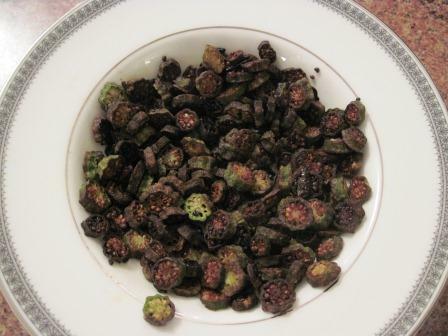 Skeptically, I gritted my teeth and determined to try the recipe with half a pound of fresh okra. The recipe is called Bhindi Sabzi, and it’s a simple stir-fry. You wash the okra and dry it very thoroughly. Then cut it in quarter-inch rounds. I made Tom do this, because I couldn’t believe it wouldn’t immediately ooze slime, as it always used to do when he’d slice it right after washing and draining it in a colander. To the surprise of us both, this time it didn’t. Then the okra is tossed into a hot skillet with vegetable oil and some chopped green chilies. 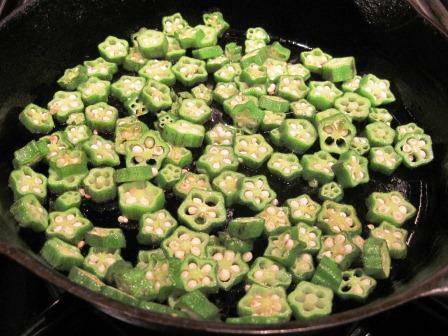 Even hating okra, I’d had to admit it made very pretty, quincunxy slices, and so it did this time. So I sautéed it and stirred it until it became lightly browned (never salting it until it was done, lest the salt draw out water and – ugh! – slime). It ended up as a very nice, simple vegetable dish, firm-tender, pleasantly and distinctively flavored. The mince of chili blended with the okra’s slightly sweet, slightly spicy flavor to make a good accompaniment to any grilled meat. One caution: Sahni says to cook the okra initially over high heat, then medium heat for 20 minutes, and then high heat again to brown it. I have to admit, the first time I did this, the okra burned in the last few minutes. But even the burnt bits tasted good enough that I chose to make the recipe again, cooking it for quite a bit less time than she indicated. As you can see, in my second attempt the okra was barely browned, and I think it would have benefited from more time on the stove to crisp it. But that’s cooking – trial and error, until you get a dish the way you really like it. For the first time in my life, I enjoyed okra enough that I can see myself working with it until I get it right. No matter what the fusion cuisine people may say, my trouble with Asian cooking is that I’m not good at incorporating an oriental recipe into an otherwise-occidental meal. Therefore, I always end up “doing Asian” much more elaborately than I intended. That’s a lot of cooking. It all started with that mushroom recipe, which I had made before and liked a lot. 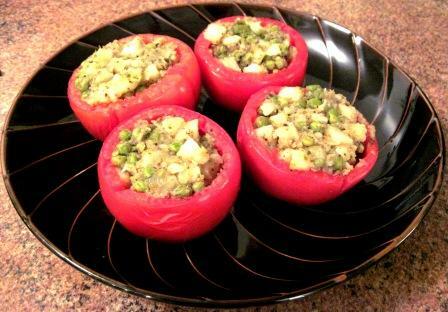 The headnote recommended them wrapped in bread as an appetizer or accompanied by a tomato pilaf. 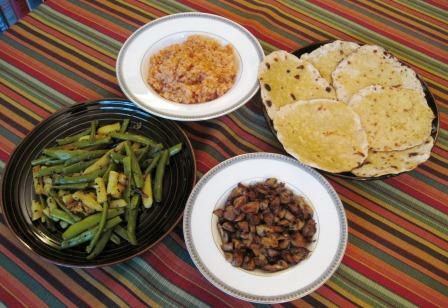 The book’s breads section provided an intriguing flatbread recipe made with pureed fresh corn kernels and said it was lovely with the green bean preparation. Three new dishes there, and it’s the height of local corn season: I couldn’t resist. For Khombi Tarkari, mushrooms are snuggled up in a sauté pan with onions, ginger, garlic, hot green chilies, turmeric, roasted cumin seeds, and lemon juice. Tom, my chili handler, was uncharacteristically intimidated by the fierceness of our newly purchased chilies when raw, so we used less of them than the recipe called for. 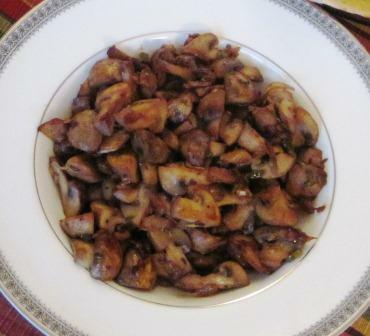 But cooking tamed them mightily, and they didn’t overpower the mushrooms. Altogether, these ingredients indeed made a spicy dish, good warm or at room temperature. I probably wouldn’t have tried Bangla Aloo Sem on my own, since I don’t keep mustard oil in my pantry. But the recipe said vegetable oil and dry mustard powder would be OK, so I made it. 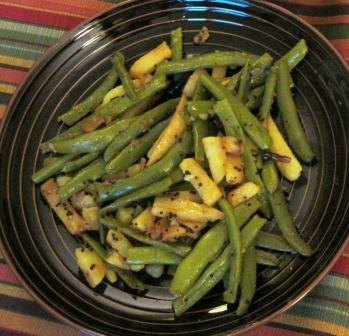 Cut in similar-sized pieces, the beans and potato are first sautéed in oil flavored with black mustard seeds, turmeric, garlic, and dried red chilies. Then they get the dry mustard and a little water, are cooked covered until tender, and are uncovered briefly to evaporate excess liquid. They were delicious, though you had to be careful not to get a forkful with lurking pieces of the truly fierce Arbol peppers. Most of Sahni’s pilafs are made with previously cooked rice. That was new to me, but I’ve noted it for days when I’ve cooked too much rice for another purpose. Tamatar Bhat is a very simple pilaf, with the rice stirred into a puree of tomatoes sautéed with chopped onion and crushed coriander seeds. The cooking time seemed long for already-cooked rice, and indeed the dish came out rather porridgy looking. But it tasted fine, though mild. Bhutte ki Roti was, of the four, the recipe I had been most intrigued by. 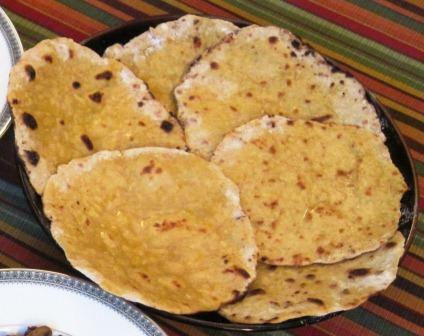 The flatbreads are made with pureed fresh corn kernels, a little salt, a little oil, and enough whole wheat and white flour to hold it all together. They’re rolled very thin and cooked quickly on a very hot cast-iron griddle. Alas, mine needed a lot more flour than the recipe had suggested, and they came out looking rather sickly. Also, they didn’t taste much of corn, even though we (Tom is also the griddle cook of the family) had finished them by holding each one with tongs directly over a high flame, which was supposed to intensify the roasted corn flavor. By that point, they had a nicely rustic look, but not the intensity of flavor I’d hoped for. So, after making all this, we sat to supper with the four dishes on the table at once and amused ourselves by tasting them in different combinations. They went amazingly well with each other and with the lovely Hugel Alsace Gewurztraminer we drank with them. 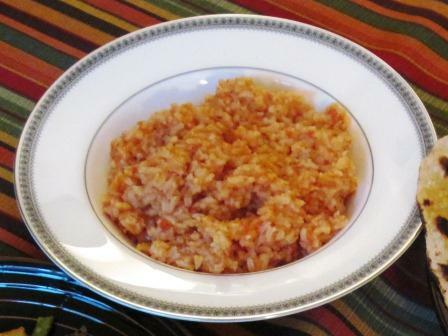 The two mild-flavored dishes, the pilaf and the breads, were excellent foils for the two spicy dishes. The spicing of the mushrooms was different from the spicing of the beans and potatoes, but all the vegetables harmonized rather than competing. For both Tom and me, the star was the Bengali green beans. They were both sufficiently familiar and sufficiently different from any way we’d ever cooked green beans. These, I could actually imagine fusing into an occidental menu. 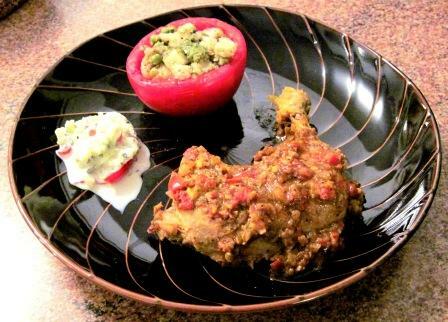 All in all, this was a rich and satisfying combination of flavors, even for normally dedicated meat eaters. This whole menu started with my shocked realization that local tomato season is more than halfway over. In the face of that grim fact, I knew I must eat more tomatoes, more often, while the vines are still producing. Come mid-winter, I’ll regret every tomato opportunity missed. So I found an intriguing recipe for Stuffed Tomatoes with Potatoes and Peas in Madhur Jaffrey’s World of the East: Vegetarian Cooking, gathered my ingredients, and set to it. The stuffing is the very same mixture that goes into samosas, those irresistible Indian deep-fried pastries. 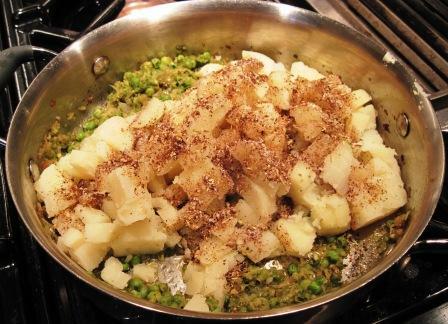 The potatoes and peas are generously spiced with onion, ginger, green chili, coriander (both leaf and seed), roasted cumin, cayenne, garam masala (homemade, I proudly say), and lemon juice. This mixture smelled so good while it was cooking, I was hard put not to keep snagging tastes. Jaffrey’s directions for hollowing out the tomatoes were very particular. Cut out the stem base by making a tiny conical hole, and through it blindly scoop out all the pulp and seeds, taking care not to pierce the shell wall. I thought about trying to do that, and if I succeeded, then filling the tomatoes through those tiny holes – not overstuffing them lest they crack open in the oven! – and I said Sorry, no way. I just took a slice off the top of each tomato and excavated the cavities in good light, inauthentically but easily. Then all it took was piling the samosa filling into the tomato shells and baking them 15 minutes in a hot oven. Delicious. My original dinner plan had been just to broil some chicken legs to serve with the tomatoes. But Tom (who’d been cooking along with me and who’s no fan of plain chicken) pointed out that we had all those ethnic ingredients handy, so why not do something Indian with the chicken. I turned to the Indian volume of my old reliable Time-Life Foods of the World series and lucked into another new recipe for this week: Murg Kari. Though translated as Chicken Curry, it isn’t much like what I think of as the typical recipe based on commercial curry powder. Cut-up chicken pieces are braised with yogurt, tomatoes, onions, garlic, ginger, garam masala, cumin, coriander, cayenne, turmeric, and fennel. Except for the last two ingredients, the spices are the same as those in the samosa stuffing, but the flavors turned out totally different. And very good. The recipe was easy to make, if you happened to have all those spices sitting out on the kitchen counter anyway, as I did. Also, since we had the yogurt container open, we used some to make a mild raita (tomato, cucumber, ground roasted cumin, and mint). The freezer contributed onion parathas, which Tom toasted on the griddle, and the refrigerator yielded jars of tamarind chutney and lime-ginger pickle – all of these by way of Kalustyan’s, the most complete purveyor of Indian and other Asian ingredients west of Mumbai. And the wine closet produced a lovely bottle of Trimbach Alsace Riesling. All the flavors, we thought, were both authentically Indian – at least by our lights – and delightfully different from our normal meals. The Riesling got along with them just fine, though we suspect a Gewurztraminer would have matched even better.